are you looking for positive jump in your rankings? If, yes then you're at correct place. So, what you're going to get in this 3 Tier LINK pyramid ? What makes this LINK pyramid the strongest and better than others ? 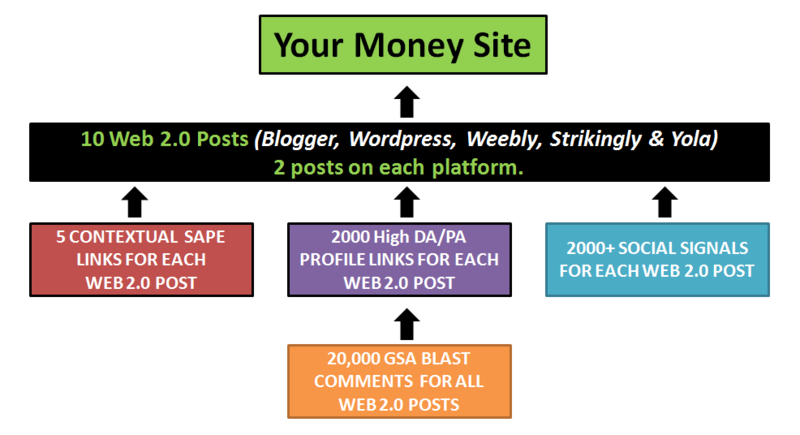 Secondly, I will be creating 1000 good DA/PA forum profile links for each of the Web 2.0 post. Thirdly, I will be pointing 5 contextual SAPE links for each web 2.0 post. Fourthly, I will do GSA Blog Comments for all the Forum Profile Links. Is this gig safe for money sites? For what kind of keywords this service is best for? What you are suppose to provide me ? Only 1 URL accepted at the moment. 5 Anchor texts which you want me to use for Web 2.0 property posts. What I am suppose to provide you after delivery? I will provide you detailed report of all the backlinks in form of a zip folder.